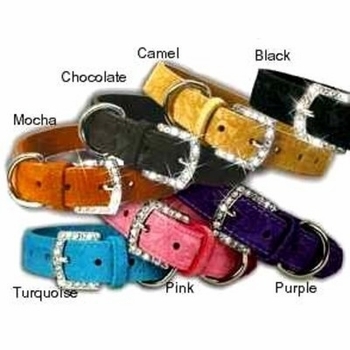 Beautiful, glamorous soft suede leather collars with crystal buckles. The soft feel and texture of these collars makes them a must have for your dog. This dog collar is available in 7 colors: Black, Carmel, Chocolate, Mocha, Pink, Purple and Turquoise and in the following sizes. #6125 is 1/2 inch wide and available in sizes 10, 12 and 14 for $9.99. #6126 is 3/4 inch wide and available in sizes 16, 18 and 20 for $11.99. Size 10 will fit a 6 inch to 7-1/2 inch neck. Size 12 will fit a 7-1/2 inch to 9-1/2 inch neck. Size 14 will fit a 9-1/2 inch to 11-1/2 inch neck. Size 16 will fit a 10 inch to 12 inch neck. Size 18 will fit a 12 inch to 14 inch neck. Size 20 will fit a 14 inch to 16 inch neck. Size 22 will fit a 15 inch to 18 inch neck. Size 24 will fit a 17 inch to 20 inch neck. Size 26 will fit a 19 inch to 22 inch neck.